We have been baking cookies all month long in preparation for the holidays. We’ve been baking gingerbread, shortbread and classic sugar cookies. The other day my daughters asked if we could bake a chocolate cookie. 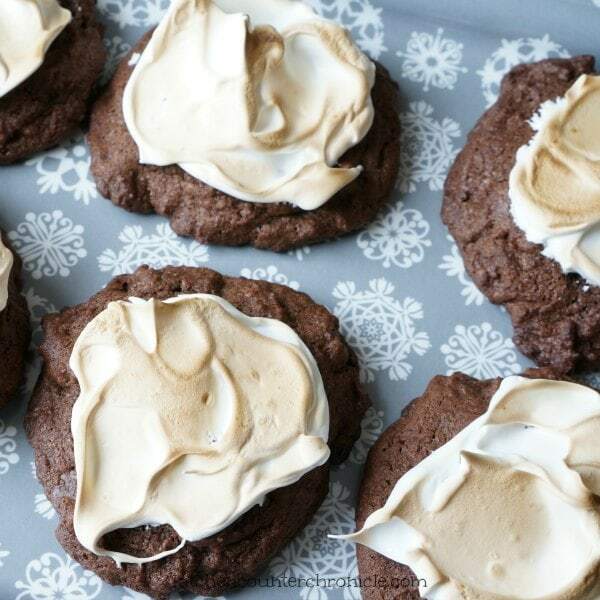 Last summer we made a delicious batch of chocolate cupcakes with toasted marshmallow frosting and that inspired me to try baking these delicious hot chocolate cookies. I mean what is better after a day out in the chilly weather than coming home to a toasty mug of hot chocolate in cookie form!? That’s exactly what these cookies taste like. 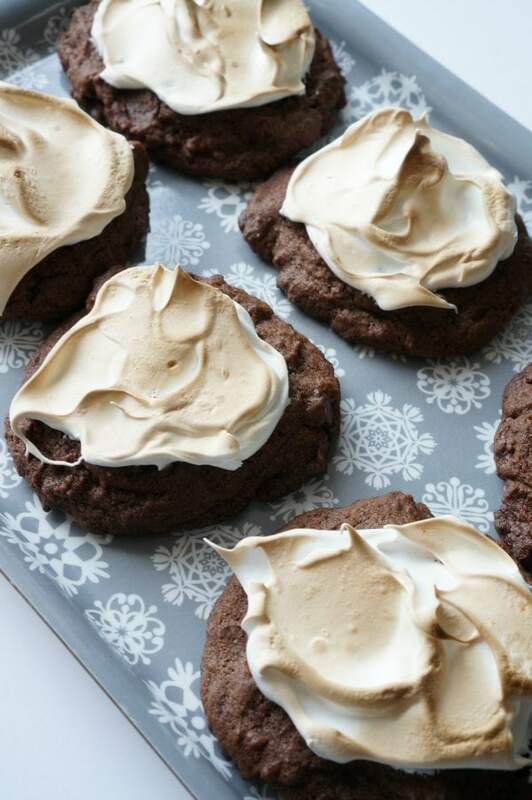 Take a classic, simple chocolate chocolate chip cookie and top it off with soft marshmallow frosting that has been lightly toasted in the oven. It’s going to be hard to top this awesome cookie. 1. Cream together butter, white sugar and brown sugar until fluffy. 2. Mix in eggs, one at a time and add vanilla. 3. 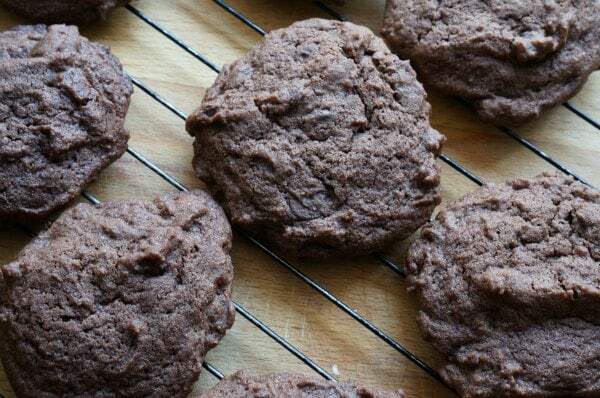 In small bowl, whisk together flour, cocoa powder, baking soda and salt. 4. Add dry ingredients, in two batches, to the butter and sugar mixture. Mix until completely incorporated. 6. Drop 1 tbsp of cookie dough onto parchment paper, the cookies will spread so place them 2 inches apart. 7. Bake in 350°F oven for 12-15 minutes. 8. Set aside, to completely cool before topping with the marshmallow frosting. For the frosting, you will need to create a double boiler. A double boiler is simply a sauce pan with an inch of simmering water, with a heat proof mixing bowl placed on top of the sauce pan. This will cook the egg whites gently, without scrambling the egg whites. 9. Whisk together egg whites, sugar and cream of tartar in a heat proof mixing bowl and place over a sauce pan of simmering water…whisk constantly to dissolve the sugar, about 1-2 minutes. 10. Once the sugar has dissolved, pour egg whites into electric mixer and beat with whisk attachment until soft peaks form…about 5-7 minutes. 10. Whisk in vanilla and salt. 11. 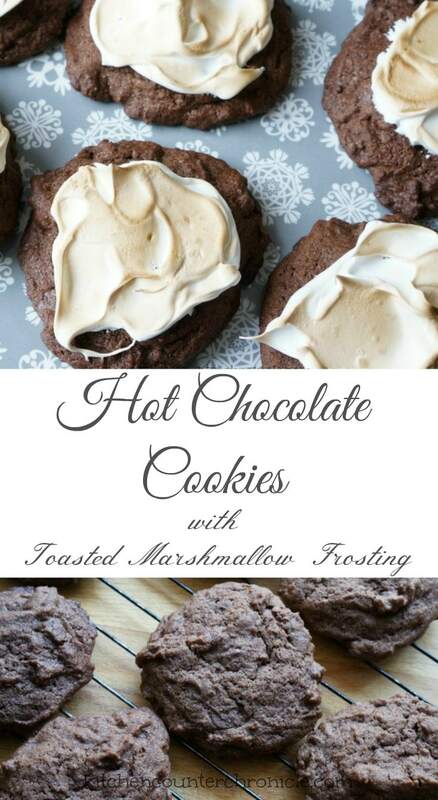 Use an offset spatula to spread the marshmallow frosting onto the cookies. Alternately, add the marshmallow frosting to a piping bag and pipe the frosting onto the cookies. 12. Turn the oven broiler on and place frosted cookies onto parchment paper lined baking sheet. 13. Place cookies under the broiler to toast the marshmallow…this will take seconds…don’t even close the door and certainly don’t walk away. 14. Let the cookies cool and enjoy. 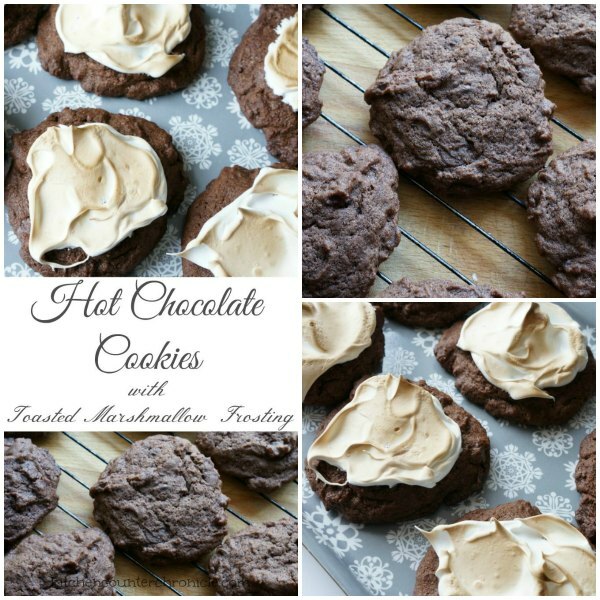 Follow Jen at KitchenCounterChronicle’s board Christmas Cookies on Pinterest. Ohhh my these look amazing I can’t wait to give them a go. Oh my word – these look divine! Must try (and eat!) these as soon as possible!